Steve Moore is FishingTech’s spirit animal. An avid pedal kayak angler, we first stumbled across his YouTube channel, Kayak Hacks Fishing, back in March in our post on cheap DIY kayak mods. To put it simply, Steve never appears to accept a problem or inconvenience without a fight. Not enough leverage on your kayak’s steering? Hack the rudder handle. Want an anchor trolley on your kayak, but don’t want to go through the hull? Steve’s got you. Need a quick and dirty hull repair to make it through the rest of a season’s keel dragging? No problem! Steve also occasionally beaches the kayak in favor of wading, shore, spin, and fly fishing. There’s even the occasional Tenkara appearance. The man is no slouch, either. 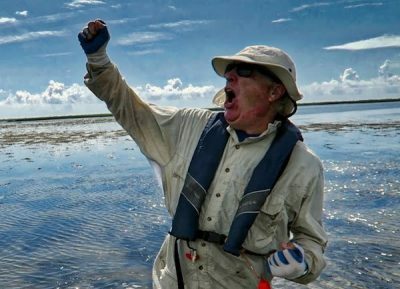 His experience fishing for going on six decades shines through in his writing for Southern Trout Magazine and Southern Kayak Fishing magazine. He’s also penned a series of books on smallmouth bass, trout, and shad fishing in the Mid-Atlantic. Can you give a quick synopsis of your position from the Humminbird HELIX 7 vs. Deeper PRO+ video review? Any updates a few months on? Any new fish finder tech intrigue you? Before I comment on the two fish finders, recognize 95% of my fishing is inshore, shallow brackish water. The other 5% occurs when I can escape to the mountains of North Carolina to reconnect with small trout streams where fish finders are not appropriate. I had high hopes for the Helix when I purchased it several years ago but quickly discovered given the tide cycles, it was pretty much useless for my inshore location. It was nice at high tide when the water level would be above 3 feet, but not good at any other point in the cycle. It just became a way to use the sonar to discover the depth of the water and figure out where the channels were. Also, once I moved to a fishing location, I anchor to work it, and the Helix does no good when stationary with only a few feet of water below the kayak. I can see it would be a significant advantage in a lake with deeper water – not so much for me. So, looking at the Deeper, it makes up for most of the shallow water shortcoming. Like the Helix, I use it in “boat mode” when moving to find channels. Once anchored, I can cast it when needed to float with the tidal current in a channel. However, the Deeper has the same limitation as the Helix. You need 3 feet for the Deeper to activate. Another limitation that applies to both systems in shallow water is the cone of discovery does not have the opportunity to spread out into a wide search area. At least with the Deeper, I can twitch the line, cause it to wobble and move the cone of discovery through a wider area. I recently tested the newer Deeper Start model – a much cheaper version than the Deeper PRO+ – and found that it would meet most of my requirements for the inshore environment with the exception being that it does not have a “boat mode.” Granted, this model was designed for shore fishermen, not kayakers. But, if you regard the kayak as a floating shoreline, it is usable. Given a limited budget, and assuming familiarity with the inshore environment based on doing reconnaissance at low tide to find the channels, having it to float the channels when the water is high enough makes it a good, inexpensive alternative. Have you ever used one on your kayak? If so, why, and if not, why not? Before purchasing my first kayak, I fished from a canoe for years and used a trolling motor to move around small lakes. I assumed I would use a trolling motor with the kayak and bought one when I purchased my Native Ultimate. I used it for about half a season and realized I was missing a key element I needed from kayak fishing – exercise! Also, in a small kayak as opposed to a more spacious canoe, it ended up being more of a hassle with the large battery, the trolling motor mount and the motor itself. Finally, once I became familiar with my inshore environment, I realized I spent a lot of time in a foot or less of water with the trolling motor retracted and unusable. Granted, it did provide a way to move quickly against the tide when there was more water, but as I have learned my local water, I realized I could work around that advantage. After having a Jackson Coosa for a couple years now, what are your general thoughts? Why’d you go with the Jackson and how has your decision been validated? What’s your take on the principal of Mirage Drive vs. propeller? I have only had the Jackson Coosa FD since December 2017 and did not start fishing in it until April. So, it was a brand-new experience for me this season. If you look on my YouTube channel, I have a playlist tracking how I made my decision with a downloadable spreadsheet rating all the characteristics of the different models I considered. Recall I spend most of my time fishing in shallow, brackish water. There are plenty of obstacles to deal with including hitting submerged oyster beds, sandbars as well as picking up seaweed/vegetation. While the Hobie options are all good, it basically came down to two key features of the Jackson. The fact the propeller can operate in both regular and shallow mode was critical with automatic retraction when hitting a submerged obstacle. The other feature was the ability to open a hatch, retract the propeller and clear it when vegetation tangles. As a side benefit, I can withdraw the propeller when anchored to avoid having my line tangled when fish run around the kayak. On any other kayak, I would have to remove the entire drive unit to obtain that same benefit. While the Hobie can operate in very shallow water as well, it cannot handle a hit on a submerged obstacle or be able to clear anything tangled in the drive without removing it. What fishing apps do you use and why? Do you use any non-fishing apps (weather, messaging, etc.) for fishing purposes? I am a real fan of the free Anglr app (editor’s note: iOS and Android). The company behind it is aggressively improving it with new features coming out on a regular basis. It is so much better than the others I evaluated. A shortcoming of the app is it does not handle tide tables right now, but I have been told that feature is on the development schedule. For freshwater, it does look up the nearest gauge and pull information from that. I also use TideGraphPro (iOS) and and PredictWind. The tide is critical to understand. Unlike in freshwater where the fish mainly hang around the same location, in a tidal environment, the fish move with the bait and the water level. I remember a guide told me he gets a kick out of people who watch where he fishes and then go try and hit the same spot after he leaves. What the observers do not know or understand is a spot is only good at a certain tide height. In my several short years of inshore fishing, I can validate a good place may only be ideal at a precise height and then the fish move on. With the tide app, I can watch the tide cycle in real time and know when to move to the next place. I use the wind app for safety. Having a reasonable estimate of the wind speed allows me to make a better decision on whether to go fishing on any day. This app charges around $30 a year, and it is well worth it. I also use AccuWeather for the MinuteCast to understand the rain pattern – especially when on the water. Also, I also use LightningMaps.org to know where lightning is striking and where the storm is moving when I hear distant thunder. How is it working for you? Can you describe your setup? What are your thoughts on fishing cameras (underwater to see fish behavior) that network with fish finders? I use a GoPro Session and just upgraded from a Hero5 to the Hero7. I run the Hero from the front on a PVC mount I created to hold the camera on a cheap stabilizer to keep the camera level. To eliminate wind noise, I created my own “dead cat” cover to protect the microphone. Even though the Hero has a wind noise setting, I found that it was not effective. I run the Session on an extended arm in my back to obtain the side shots. Have you seen folks using drones for fishing purposes (spotting, extended surf casting, etc.)? What are your thoughts on the technology? I have not seen people using drones yet. I think the concept is interesting but limited. It would be interesting to see how a drone handles the glare on the water to be able to look below the surface and find fish. For a kayak application, there may be a space limitation to deal with an additional piece of equipment. Finally, I think you might spend far too much time playing with the drone when you could be fishing! Featured image courtesy Kayak Hacks Fishing.